Since we have been friends for a while now, I want to show you how it really is most of the time. To be fair (to me) this picture was taken last week when I had a migraine for 4 days straight. I was capable of getting NOTHING done. But it is pretty typical. 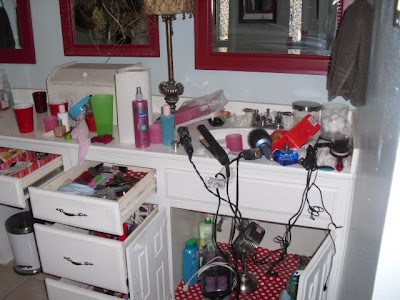 This is exactly what my bathroom looks like after I get ready. I always wash my face and brush my teeth in Marcus's sink, because mine usually has a hair dryer or Chi in it. Water rarely has come out of that tap. See...more cups. I am a thirsty girl. Sadly it looks like I staged this picture with all the drawers and doors open. I did not. I actually don't mind loading the dishwasher. I just don't like to unload it. That's what these dishes are waiting for. I am not the kind of person that would let anybody in my house looking like this though. If I know people are coming over, even my family, everything is cleaned and picked up. That's why my closets are a mess! I just didn't want to give any kind of false advertising about myself. I am domestically challenged. I don't know what it is, but I don't like unloading the dishwasher either! Thank you so much for this reality check. It's nice to see that I'm not the total domestic failure that I seem to feel like sometimes. I have 4 children of my own and it's a constant job just to keep everyone alive and fed on some days, much less keep the house company ready! Our real life just doesn't leave always leave time or energy for getting it all done. And I forgot to mention, I despise loading the dishwasher too! What is it about that? I love it that Im not alone!!! I love this!!! Thanks for keepin' it real. It makes me so happy to know that I am not alone....my house looks just like that right now! God is good! This totally made me feel better about myself...I can't thank you enough for keeping it real...and showing my husband that there are other women out there who never turn the water on on their side of the sink....that the wife's side is there exclusively to hold hair dryers and stuff:) Loved the post! Welcome to the Club!! LOL! I am the same way....when I have people over, the house looks perfect. But, not on most days or at least until the weekend! 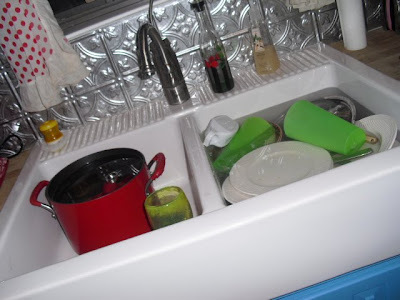 I also HATE to unload the dishwasher....therefore my dirty dishes stay there too! tee hee. This makes me feel SO MUCH BETTER. I've been to your house a hundred times and it's always been perfect. I always wonder why I can't keep my house up like Dina's. I'm glad you are not a perfect housekeeper. My house looks just like that everyday! I love these pictures. I feel so not alone! I also don't like unloading the dishwasher. Love the photos! My house looks like that all the time also. It's the real deal! i love the honesty of this post!!! my house looks like that on a regular basis. actually worse b/c i have a 14 month old little boy to chase around all day long! just wait, once your little one arrives, your house takes on a whole new meaning of messy! but, it won't matter nearly as much to you!!! I have to say I like you even better now that you showed us your dirty little secret. My house is a pit most of the time too. There's been times that I feel like, "if someone knocks on the door right now, I'll have to hide and pretend I'm not home." It's not usually that bad, but it happens occasionally. Thanks for keeping it real. P.S. It gets worse when you have kids! Now thats a house!!! Just wait for a baby!!! it will be even better! Dina, I just couldn't be more happy for you! I was sooo excited when Amy told me you were pg. You are going to be an amazing mother. Your child will have the BEST nursery EVER!!!! I know we say this all the time, but we HAVE to get together. I know Jennifer would love to see you too. We need to plan a lunch. 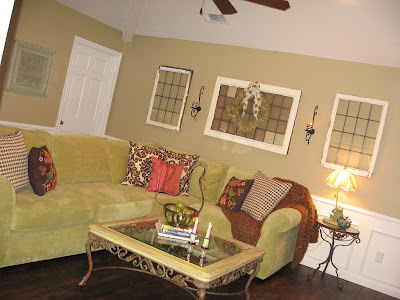 please leave a comment and tell where your green sofa came from!! i LOVE it!! Amen! 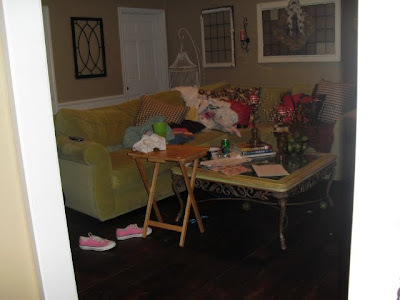 I am also domesticaly challenged I like to blame it on the kids and their mess. Hi just found your blog from Kelly's Korner. Your house is too cute! 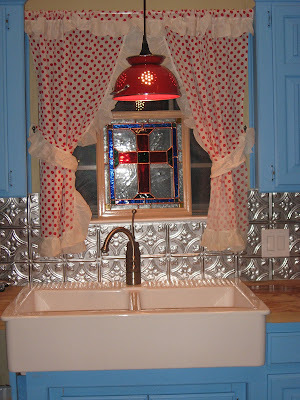 Love your back splash in the kitchen & for keeping it real! Thank Goodness...I was beginning to feel really bad about my domesticity! LOL! We are offically friends. Your house will probably look like that MORE after the baby is here. 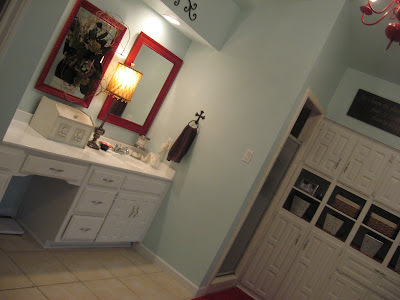 It's good to know I'm not the only one whose bathroom looks like tornado went through...daily. Thanks for the comment on the bedding. Thanks for keeping it real :) It's good for all of us to see other people's messes (i.e. real life) some times! Okay so messie or clean I still love your place and your style! Hi Dina! Unloading the dishwasher is also my least fav household chore (among many), and I also have a problem with shutting drawers and cabinets. It drives Zak nutso. He keeps thinking I'll change. We've been living together for well over 10 years, and so far, I'm still the same. I had so much fun cathing up with you earlier this month! Take care of yourself and that little bean! (Also check E-Bay for new or used maternity clothes, and Etsy for cute baby clothes). Just an FYI, I don't mean to be a debbie downer, but I ordered my daughter's 1st birthday tutu outfit from the COTTON CANDY SHOP last year and had some trouble with them. I ordered it 6 weeks in advance. 2 weeks before her party, I heard nothing from her and I emailed her. A week later, I was informed she didnt take note of the initial of my daughter's name and completely forgot about the due date of my order. Needless to say, my daughter's cheaply-made outfit arrived the day of her party. I believe with my crappy sewing skills I could have done much better, lol. It was a gerber onesie that had the crappiest monogramming work I had ever seen. It was ridiculous! I wouldn't order from them again! There are much better online shops that do much better work! If your gonna pay that much for a tutu set it should be made well. Sorry so long!